When three games based on the same theme and format get released, you know the software provider has struck gold with a winning formula. And that’s exactly what Microgaming can attest to with their Retro Reels trilogy of slots. The first, simply named Retro Reels, was released in 2010. Only one year later the Diamond Glitz version was launched with the Extreme Heat version making its debut shortly after. 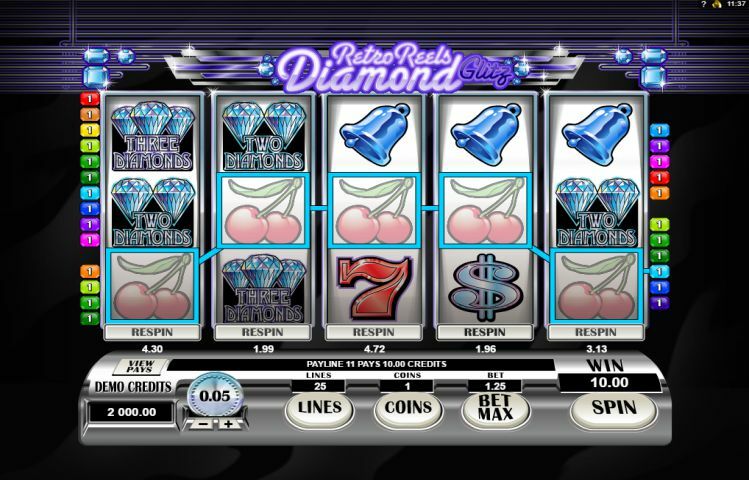 Today, we’ll be looking at the gem of the three, the Retro Reels – Diamond Glitz Online Slot. As the name implies, everything about this game’s appearance is retro – from its shimmering symbols like Cherries and Sevens to its quirky sound effects and jazzy soundtrack. But what sets Retro Reels Diamond Glitz apart from the other two is its theme. With diamonds in the backdrop and on the reels, this is one glammed up slots game. The 5-reel, 25-payline slot’s payout potential however is anything but old school. Let’s take a look at the base game symbols on Retro Reels Diamond Glitz. If three or more of the following appear on a selected payline, you could pocket up to 10,000 coins: Cherries, Bells, Sevens, Single Bars, Double Bars, Triple Bars, One Diamond, Two Diamonds, Three Diamonds and a Dollar Sign. And while the slot might not have a Wild, it does boast a Scatter which is the 5 Free Spin Bonus icon. Should 3+ Scatters appear on your screen it will trigger the slot’s Glittering Free Spin Bonus. Three Scatters equal 15 Spins, while four Scatters will trigger 20 Spins and a total of five Scatters will reward you with 25 Spins. Better yet, all your wins during this Free Spins round will get doubled, plus it’s able to be retriggered. And best of all – you can pocket up to 440,000 coins during Free Spins. The feature that put the Retro Reels games on the map is undoubtedly its Respin option which gives you extra chances to get a winning symbol combination on the reels. How does it work? After each spin, you’ll get the option to respin a reel at a small cost to you, indicated beneath the reel. To activate it, simply click on the ‘RESPIN’ button beneath the reel you’d like to respin. This feature can really boost your winnings but isn’t available during the Free Spins round. Want to enjoy the respin thrills of the Retro Reel Diamond Glitz Online Slot? Simply make your way to Gaming Club Casino where you’ll find the complete trilogy along with over 500 other top notch casino games. As a new player, you’ll receive two welcome bonuses, worth a total of up 350 bonus credits in your currency. Simply make your first two deposits and you could score up to 200 and 150 bonus credits respectively. Beyond that, Gaming Club will also treat you to daily bonuses, mega promotions, loyalty rewards, free slots tournament invites and many more sought-after player benefits. Joining Gaming Club is quick, easy, safe and secure. Why wait?